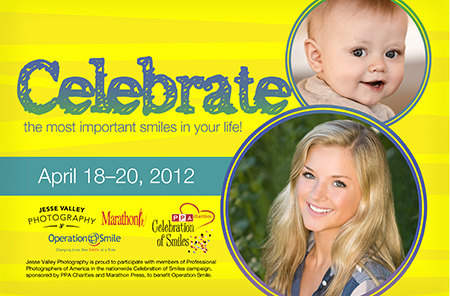 DON’T MISS OUR SPECIAL “CELEBRATION OF SMILES” PROMOTION! April 18–20th, Jesse Valley Photography will participate with an elite group of photographers around the country in a very special portrait promotion. During that time we will be providing a wonderful opportunity for you to update portraits of yourself and any family members you wish. In doing so, you will help to support Operation Smile, which provides free surgeries for children around the world who suffer with cleft lips, cleft palates and other facial deformities. Along with other members of Professional Photographers of America (PPA), we are offering the gift of an individual portrait session and a desk-size portrait in exchange for a $24 donation to PPA Charities, which has chosen Operation Smile as its charitable partner. For every 10 individuals we photograph, another child will receive the gift of surgery! It costs as little as $240 for Operation Smile’s medical volunteers to provide a life-saving surgery that can take as little as 45 minutes. One hundred percent of each donation will go to Operation Smile. We also believe that our Celebration of Smiles event is a wonderful way to teach children the value of reaching out to others. Even small children can understand the importance of Operation Smile’s work, and they are eager to help these needy children. We hope you will join with us in helping to make this vital work possible, and we promise to create a portrait that you will treasure. To schedule your session appointment, which will take place at the Rose Garden at Lake Harriet, please call us today at 612/382.2867. You are currently browsing the Jesse Valley Photography Blog blog archives for March, 2012.